Hands on: Sony Xperia Z2 review | What Hi-Fi? 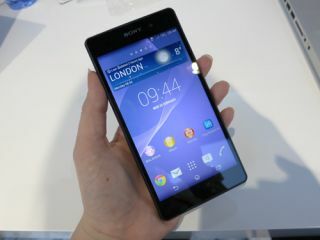 Sony had quite the bevy of mobile beauties to unveil at MWC 2014, and the Sony Xperia Z2 smartphone was just one of them. We gave it the hands on review treatment with it to see if it can live up to its flagship status. The Xperia Z2 cuts a very similar shape to its excellent Xperia Z1 predecessor, so much so, that you might not be able to tell the difference on first look. Of course that's no bad thing, as both devices offer a premium finish with a one-piece aluminium frame and tempered glass front and back panels. The distinct, angular Omnibalance design we've seen previously in the original Xperia Z, Tablet Z and more recently in the Z1 Compact, is also here, though it's been softened from previous iterations so it feels more natural and comfortable to hold. It's a touch slimmer at 8.2mm (down from 8.5mm) and has dropped some weight too, which does make a welcome difference compared to its predecessor. Despite the screen getting bigger (more on that later), the overall handset size has actually got smaller in width, thanks to slightly shrunken side bezels, while only getting a touch longer in the process. It feels nice in the hand and its unique placing of the on/off button allows for easy pressing from the regular hold position. Other buttons are kept to a minimum, save for a volume rocker and a camera button that will launch the camera app and also works as the shutter control. The waterproof and dustproof smarts remain from the Z1, meaning the Z2 will survive a dunk in the wet stuff - accidental or not - for up to 30 minutes. This of course means ports will have removeable covers, but there are only two - one for the SIM card and microUSB port and one for the microSD card slot. The 3.5mm jack on the top of the phone is waterproof in itself and doesn't require a cover. It's currently listed as available in black, white and a rather bright purple. Sony has given the Xperia Z2 screen a small bump up from 5in to 5.2in, but kept the resolution the same at 1920 x 1080. Pixel density has taken a slight drop from 440ppi to 423ppi, but it's unlikely you'd be able to see much difference in daily use. The display packs Sony's Triluminos and X-Reality technologies optimised for mobile, and adds brand new Live Colour LED technology, which is said to offer deeper colours and better gradiation without the oversaturation. Colours certainly looked bright and full of punch on the screens and in pictures we took - we'll bring you more in our full review. Finally, the screen on the Z2 is an IPS display, which makes for good viewing angles and they certainly held up to that in our early tests. The picture above shows its size compared to the iPhone 5 and the Sony Xperia Z1 Compact. As you'd expect from a new flagship phone, the Z2 brings with it a number of impressive performance enhancements. These include the latest 2.3GHz quad-core Qualcomm Snapdragon 801 processor and an extra gig of RAM, taking it up to 3GB, making sure the Z2 is faster than ever. The most recent Adreno 330 GPU is also on board too, promising a 20% increased graphical performance compared with its predecessor. There were no games loaded onto our test device, but we look forward to giving it something to chew on in our full review. Battery life will hopefully get a slight boost too, with a larger, 3200mAh battery on the Z2 (up from 3000mAh), with Sony's rather good Battery Stamina mode at your disposal if things start to get tight. As far as connectivity goes, however, it's all pretty much the same as before. You can of course expect wi-fi and Bluetooth, but NFC is on board too, and the Z2 will be 4G LTE compatible for those on the right tariffs. The Xperia Z2 will come with the latest iteration of Android 4.4 Jellybean. While Sony hasn't gone down the high-def music route like LG, it's also not resting on its laurels. Firstly, it's brought stereo sound to the Z2, moving the speakers to rather discreet positions at the top and bottom of the display. It was hard to test their success on a noisy trade show floor, but if it can implement them as well as HTC One did, it can only be something we encourage. Of course, listening through headphones is always going to be way to get the best sound - particularly in noisy environments - and Sony hasn't neglected that either. It has introduced digital noise cancellation technology to the Z2 (and the Z2 tablet) and its new bundled earphones. The effect can be always on, turned off or can be set to auto, to turn on when it picks up a lot of ambient noise. Sony says it should block out up to 98% of this hubbub. We tested it out on the already noisy stand, stood underneath speakers blasting airplane noise, and it was really quite effective. Louder, more involved songs did tend to help it out - allow the levels to drop slightly and some noise did creep through... but then we turned off the noise cancelling and the results were a lot worse. Not foolproof, then, but a nice touch for quickly and easily improving your music experience in noisy environments. Surprise, surprise, if the Z2 hasn't shown you it's a handset of much improvement, so the camera takes a jump up a couple of notches too, from 13MP to 20.7MP. Perhaps even more impressive, it's capable of 4K video recording at 3840 x 2160 resolution, supporting Sony's vision of making more people into 4K content creators, while we wait for the TV and film companies to catch up. Of course, we weren't able to test the results as you'll need to playback on a 4K TV to view the results in all their glory, but in terms of photo and video in general, the Z2 appears to be very capable. The few test snaps we took under the unforgiving glare of the fluroescent trade show lights came out looking sharp and well balanced, though there are plenty of modes to get to grips with past the Auto and manual modes, including the fun AR Effect mode, Sweep Panorama and the Background Defocus mode. Video gets the new Timeshift mode, which allows you to capture video at 120 frames a second for a slow motion effect and also Vine, for recording Vine videos directly from the camera app. The Xperia Z2 does what we'd want of any flagship handset - to come through and make us wonder how we ever did without it in the first place. The Z1 is a great phone, but this appears to better it in near enough every way. While the design is largely the same, we like its slightly softer edges and the extra bit of screen real estate will be a bonus for big-screen fans and those who like watch movies on the go.